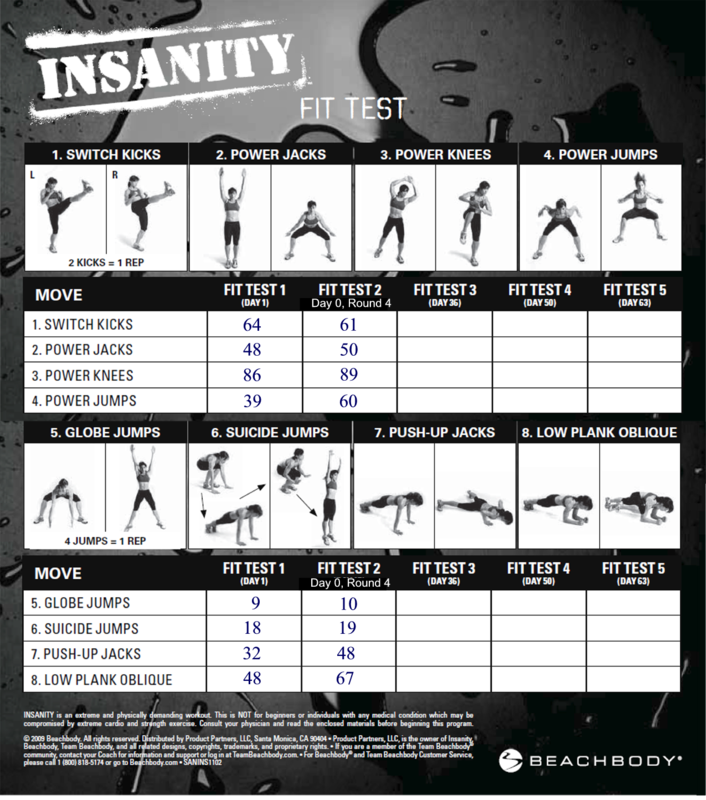 Just for “fun,” I decided to take the Insanity fit test today to see how I compared to the last time. I’ve only done the Insanity Fit Test once before at the beginning of my second Round effort, when I was introducing Insanity into the mix. As I recall, I was pretty exhaused after that first attempt. And I can say this second attempt left me possibly more winded than before. I wore my Heart Rate Monitor to measure myself throughout the fit test, and because my heart rate was peaking at very high levels, I took breaks between moves until my heart rate retreated back into the 130s. Over all, my results were better than my first attempt, sometimes significantly. But it’s hard to imagine going at it harder than I did today. I felt at times that my heart was in my mouth. This entry was posted in P90X-Insanity Hybrid, Round 4 and tagged Insanity Fit Test, P90X-Insanity Hybrid. Bookmark the permalink. That’s embarrassing, I counted as 1 kick = 1 rep. So, correct number would be 60. I’m 22 years old and light years away from Tania level performance but I believe we are on the right track. Your results and progress are amazing, wonder if you’ve got any room left for improvement. Sorry for the excuses even before starting but I’ve had an extremely busy day and literally no chance to exercise, I’ll be following with a 1 day delay and maybe catch up with a double workout day when I adjust. *Thanks for the “Fitness Tracking Tools” post but last 3 links on it are all redirected to “Nutrition Ratio Calculator”. I fixed the links in my post–thanks for the info. And your results. Tell me you’re 24 years old! 120, switch kicks? And 100 Power Knees? That’s Tania level performance. That’s taking into account that 2 kicks = 1 rep? Man. Impressive.